"...We were on line in the same foxholes until early March of '45 at which time the German threat in the Ardennes was pushed back. 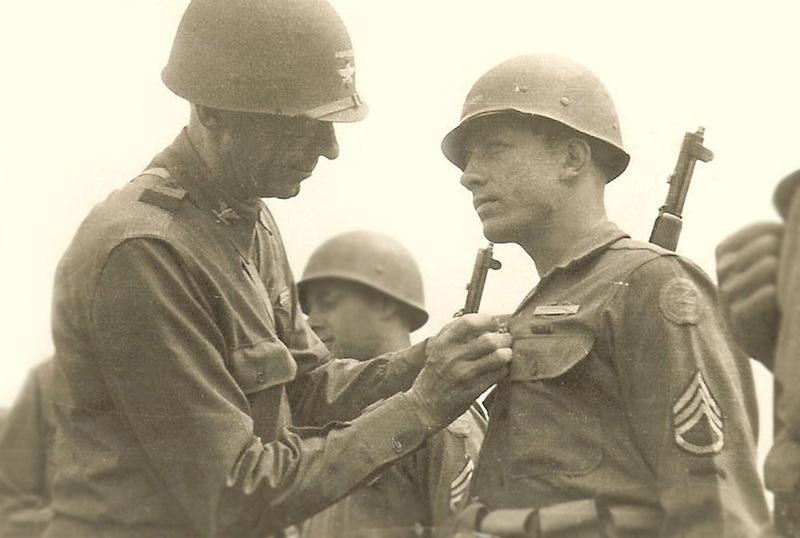 The weather finally cleared and our air force was finally able to do what they did best and em dash; blast the enemy into retreat and in par surrender..."
Col. B. F. Hurless presenting the BRONZE STAR to S/Sgt. Salvatore J. Conigliaro, Jr. The German General Von Runstedt struck unannounced and unexpectedly on the 16th of December, 1945 at the Allied lines 50 miles south of our position. This was the beginning of the "Battle of the Bulge." Our command was preparing for the Roer River crossing. This all came to a screeching halt and attention was directed to halting their drive. What would our role be in this effort? All kinds of maneuvering and relocation of combat units were quickly and efficiently taking place in order to stop this last ditch blitz by the Germans. The result of this activity was that the 102nd was ordered to hold the entire XIII Corps front. We were to have virtually no reserve units as the 84th Division was pulled as were the 2nd and 7th Armored Divisions. We were to cover eleven miles of front line with every infantryman on line and spread out. The 102nd was alone. We were far below our full strength due to casualties caused by Germans and the weather. It was winter and cold, very cold. Trench feet were our biggest enemy in this wet, freezing place called hell. In G company we had twin brothers, James and John Groerich, two good-looking good soldiers. They were not in my platoon but I knew them. I then, as now, cannot understand why in Heaven's name they were placed in the same company &emdash; but what the heck do I know? At the end of each day we would assess our activity and our casualty status. As a result we would then ask for replacements, when available. On this report was listed John Groerich. Killed in action. Any death was painful as was this one, but this one especially so. I cannot imagine the pain, the heartache of his brother, James. So many were taken from us, so young. If my memory serves me, the military in it's infinite wisdom pulled James from the front line. I don't recall whether he was sent home or whether he was given duty as a non-combatant. During this hellish period while the 102nd was holding the entire line of the XIII Corps there were all sorts of devious things done to fool the enemy into believing that we were at full strength and preparing to launch our attack over the Roer River. We were assigned a few half tracks, which sound like tanks when they are moving. Our people would shuttle these units continuously to give the illusion that we were building our forces. If they only knew how vulnerable we were. Thanksgiving and Christmas and New Years were like any other day except for the fact we were promised hot meals for these holidays. Oh joy and rapture! As it turned out the best they could do was a turkey sandwich. There was no way we could be pulled off the line. We were really hurting for some relief. It wasn't to come. We were on line in the same foxholes until early March of '45 at which time the German threat in the Ardennes was pushed back. The weather finally cleared and our air force was finally able to do what they did best em dash; blast the enemy into retreat and in par surrender. Now we could continue where we left off in December. It was a long wait. There was one incident when I was alone in my foxhole. It was early morning and very foggy. (That's why our planes couldn't fly.) I heard this rumble in front of my position. It was getting louder and louder when suddenly directly if front of me was this huge Mark IV tank heading straight for my position. I couldn't get out of the way; that would expose me. I certainly was not going to surrender so I did the only thing I could possibly do. I settled down to the bottom of my foxhole and prayed that it didn't collapse when the tank overran my home away from home. As luck would have it (they don't call me 'Lucky' for nothing) my hole in the ground remained in tact. The tank went about 25 yards past my hole and turned and went back to wherever it came from. Unfortunately, I had no firepower that could have stopped it. I told about our Roer crossing and a day or so afterwards in the first part of my wartime story (Vol. 50, # 1). Now we pressed on. An interesting side note to my recollections is that all the activity of the war from the moment we landed in France I recall or perceive in black and white. I have no recall of anything in color. It's as though the laws of color were repealed. The Psychiatric community should have a field day with that. Our front advanced freely after crossing with little or no German opposition. The terrain was flat in this area where farming thrived before the war. There were scattered mounds of compost and acres and acres of unworked farmland with an occasional cluster of trees. Each cluster was like an island of vegetation or an oasis in a dying sea of farmland. It seemed that the enemy just vanished but really had pulled back in order to reorganize. Suddenly there was a scream across the sky and an explosion with dirt flying everywhere. It was an unmistakable German 88 shell screaming at us and exploding much too close. One of my men, I believe it was 'Shorty' Randolf Palermo, who spotted the tank that was firing at us. The tank was located in a cluster of trees directly in front of us and firing point blank at our position. We were very vulnerable -- sitting ducks as it were. Needless to say, everyone hit the ground. We were pinned down in a open field with little or no protection. I was fortunate to have scrambled for safety behind a compost mound. At this point I called for my bazooka man, Jim Chance, to move up to my position. He scrambled up to me while struggling with the bazooka and rockets he was carrying. After settling down next to me we turned our eyes to the tank. Jim and I agreed that we were not ready to meet our ancestors. The German gunner fired another round as we lay petrified. We actually saw this missile come out of the muzzle of the cannon and scream in our direction. "Oh, my God, it's coming straight at us. I can see it!" "Me, too" Jim said as we tried to shrink into the ground with our short lives flashing before us. At this point it exploded about 20 yards short of our position, thank God. This situation was untenable. I tapped Jim on the helmet and said, "Let's load up that bazooka of yours an take a shot at that damn tank." "Load her up Lucky." I pulled a rocket out, stuck it in the tail end of the bazooka, wired it hot and tapped him on the helmet. He took aim and let go. It fell short. Jim adjusted his line of sight as I loaded another round. Jim uttered a few choice words and fired. This time he got lucky and he hit the tank where the turret meets the body of the tank. It was a killed shot because at that point the tank turned tail and headed back to his line. What a relief. During the breakthrough we were advancing quite rapidly. Other than an occasional delaying action, it was smooth sailing. As luck would have it we came across a chicken farm. My platoon hit it dead center. The war suddenly went on hold. You must keep in mind that we had been eating 'K' rations (prepackaged tins the size of a can of tuna which contained some ungodly combinations of tasteless fixings). Any opportunity to acquire a change of diet was more than welcome. Well -- this chicken farm was to us a gourmet's delight. The place was abandoned except for the chickens. We proceeded to collect eggs, chase, kill, and cook and eat fresh food. What we did was certainly wrong -- but it was delicious. After gorging ourselves we rejoined the war. We were ordered to stop and dig in for the night. After a quiet and somewhat restful night we reassessed our situation and made certain that our units on our flanks were keeping up with us. All was well and we were ordered to press on. I was wondering where the hell the Germans were. I was soon to find out and would experience some strange happenings. As we advanced there suddenly began a barrage of 88's. They were falling all around us but we were ordered to press on since we were in open terrain. At this point my platoon sergeant, Harold Klausmeyer, came running over to me and told me to hit the ground. I did and he fell along side of me. He looked at me and said, "Lucky, take over the platoon. I'm about to have an episode. I'll be OK and I'll catch up in a little while." "I understand. Take care of yourself." With that he headed for a clump of trees. I quickly rejoined the platoon. As I arose and looked ahead I saw what appeared to be a football headed at me, tumbling haphazardly. I quickly rolled to the right several times as it rolled past me and exploded about 50 yards past me. Scary!! I regained my composure and move forward to the sound of bullets impacting. I looked at the ground. All around me, in a circular pattern, were puffs of dust as bullets were hitting the ground, yet, I was unscathed. I couldn't understand it. How could that have happened without some of the shots hitting he? I did not understand it and I was not about to stand around to figure it out. Strange, but true!! We were ordered to stop again for the night and the question of the night was, "Where is Sgt. Klausmeyer? Was he hit?" Everyone was asking. I explained that Harold was feeling out of sorts and I suggested that he go see the Battalion Medics to check it out. That seemed to satisfy them. The truth of the matter was that Sgt. Klausmeyer should never have been in the service. Early on when I was promoted to Staff Sergeant he confided in me and swore me to secrecy. He told me he was epileptic. When he volunteered into the service he hid this information and the examining doctors didn't pick it up. He really wanted to serve his country. (How times have changed.) A half hour later as the guys were digging in and I was checking them to see that all was well, along came Harold. He looked at me, gave a quick wink and I returned in kind. No words were ever spoken between us regarding this episode. The men were happy to see him return. He was a great platoon sergeant -- the best!!! I further have no recollection of any other such incidents. It apparently was time for some heavy duty fighting. We were joined again by two platoons of tanks, which we were always happy to have in front of us. It was the 102nd's responsibility to attack and capture the city of Krefeld. It was the largest city to be taken to date by the Allies in Germany. The dubious honor fell upon us. The 5th Armored Division tanks assigned to us were the greatest. As we attacked Larry Poiles was hit and down. I signaled a tanker to move in front of Larry. As he did the gunner raked the area while a captured German medic tended to Larry, who was subsequently moved to comparative safety. This done, we battled our way into Krefeld. It was no easy job securing the city. The Germans were retreating, but reluctantly. Once in the city, we paired off and started doing our house to house. I was alone since I had just lost a man wounded and I was odd man out. Ground level and above were OK because it was daylight. Basements and big stores were tough. In order to clear a cellar, we would shout in what was terrible German "Come out with your hands up." If there was no response we'd pop a pin from a hand grenade and throw it in the basement. We would go in after the explosion and check the place out. In a fairly large building I did exactly as I described. I went in alone. There were a series of doors ,four or five, and I'd kick them open ready to fire. It was clear until I reached the fourth door. I kicked it open with my M-1 ready. There, sitting by a table, was a German officer with his hand on the table next to a bottle of schnapps and a silver Luger. He saw me and in his drunken stupor, reached for the pistol. I fired; he fell back - dead. My attitude during the war was, if it going to be him or me, it's going to be him. This kind of attitude was necessary if one was going to have a chance to survive. I picked up the Luger, placed it in my belt, and continued on. Strangely enough, another of my men had a similar experience. It was Pfc. Charles Simpson -- a great soldier, but then all of my men were great. The rest of the day went slowly and with lessening resistance. We were checking out a department store and we moved to check out the basement. Three of us got together. It was McDorman, Jim Chance and me. Lo and behold, we came across a rather huge safe. It was locked so the three of us agreed that we would try to blow the door off. We each carried several quarter pound blocks of TNT. We used these when it was impossible to break ground because of the freeze. We'd blast one of these blocks and proceed to dig our foxholes. Well, we set four of these to the door, moved out of harms way and let her blow. When the dust settled, the door was hanging from its hinges. There at the base of the safe was sitting stacks of German money. Since I was so wise and worldly I said that this money was worthless be cause we had been told we could use only the invasion money. They agreed, but suggested that we take a couple of handfuls to fool around with and play poker and use in the event we ran out of bathroom tissue. We all grabbed a healthy handful and left. Two days later we were informed by headquarters that we could exchange German marks for invasion money -- B-O-I-N-G!! Did I screw up or what? The first week of March the 102nd was to be given a little respite from the war -- a little R & R. Our troops fought hard and they played hard. On the third day of our rest period I was approached by some of my men with a request to join them in a visit to a 'House of ill-repute.' I really wanted to say no, but I hated not to be one of the guys. I had visions of the training films that we were shown regarding the sexually transmitted diseases and the consequences therefrom. A very strong argument not to go. Well the upshot of It was that I did leave with them -- their names not to be revealed here, by me. How they found this place was a mystery. Following a 15 minute walk we arrived at this old building. It seemed to have survived the ravages of war rather nicely. One of the guys knocked on the door and there appeared this buxom peroxide blonde. She gave us each a welcoming smile as we were ushered into this place that gave me the willies. I was scared to death and positioned myself so that I would be last in line My men have always been first with me. HA! What stood in front of us was a long corridor. It had six doors with three on each side. The madame escorted the group and as we approached a door she would grab a GI. by the arm, shove him inside and close the door behind each in turn. As the fourth of our group disappeared from view, it was now my turn. I was scared, paranoid and almost ready to panic. She opened the door for me to enter and was ready to grab my arm to help me in. I glanced inside and took one step back in horror. There Sitting on the bed was what appeared to be a 180 lb. mama with jet black long hair. I have never seen hair so black or a body so ugly in my life. I turned, gulped, thanked the madame, reached into my pocket and pulled out 50 Marks, handed it to her and ran out of there like a deer. When the guys got back to the bivouack area they asked me what had happened. In a matter of fact fashion I said that I had finished quickly and dedded to get back as I was very tired. They never found out the truth of the matter and never will unless they read this story of our experience. Our rest period ended and it was time to get back to the war. The first elements of the 102nd Division crossed the Rhine River on the 4th of April and pressed forward. The Germans were very busy defending the advance of the 1st Army at the Remagen bridgehead and were bringing as much of their forces as possible to stop that breakthrough. This, of course, lessened the German defensive capability in our sector. Although it wasn't easy, it was easier than it would have been if the enemy had not pulled out some units to the Bulge activity. We were moving very rapidly once we broke through the Rhine defenses. In an advance of this sort one squad of each platoon is given the point in their sector. My squad was in the lead position for several hours. It was stressful because you are the exposed unit and on constant vigil. Rotation time was upon us and Sgt. Klausmeyer brought up Sgt. Ken Clary's squad to relieve mine. Ken and his men assumed our point position and we dropped back into a reserve status. We relocated on the right flank slightly in the rear of Ken's unit. Everything was quiet when suddenly there was a burst of machine gun fire to my left and we all hit the ditches as another burst came flashing in our direction. The next thing I heard was Sgt. Klausmeyer screaming for a medic. I put Mac Gunn in charge of the squad, told them to hold their position and raced up the hill to where my squad was deployed some 15 minutes earlier. What I saw was Klausmeyer and the medic leaning over Ken and working furiously on him. Then all activity stopped and Harold ran back for the radio man. He checked for coordinates of our position from a map and gave them to our artillery on the other end of the radio phone. They immediately fired one round and Klausmeyer called in the adjustment and screamed, "Fire for effect." It was over but Ken was gone. There but for the grace of God go I. The machine gun nest was wiped out. When we reached the position it was not a pretty sight. You never get used to it. The strange part of it was that there were two men in Italian uniforms and a woman, all dead. Italy had capitulated quite a while prior to this incident. It was a mystery as to why the Italians were shooting at us, and why they were there in the first place. Our progress was ordered stopped and we dug in for the night. I always loved and looked forward to this time of the day because we usually had mail call at this time. I couldn't wait to see if there was any mail from Nancy. Her letters brought some sanity to our days activities. I knew I loved her dearly at this point and I knew that I wanted to spend the rest of my life with her once the mess was over. I lucked out on this night. The mail caught up with us after a dry spell and there were three letters from her for me. My mind drifted and I pictured myself next to her as she read her letters to me. My way of forgetting the war, I guess. The war was far from over at this point but the handwriting was on the wall and the fat lady was about to sing and the Germans knew this. Krefeld was behind us as was the unfortunate death of Ken Clary. Our objective was to continue on and take Hannover once we crossed the Rhine River. They redeployed us to Rhinehausen and distributed supplies for the crossing. We were at the end of March. The 102nd Division was loaded on everything and anything that had wheels. We headed north from Krefeld for about 20 miles, then west to Wesel and Lembeck. We unloaded and deployed for the drive west to the Weser River on the 9th of April. We had traveled and fought sporadically over 120 miles in 9 days. This averaged 13 or 14 miles a day. Not easy! It was obvious at this point that the main body of German forces were in chaos, retreat or surrender. More and more on a daily basis we would see our B-17's by the hundreds in formation overhead, heading for the infrastructure of Germany. From time to time we'd see one or more limping back to England with a contrail of smoke or a sputtering engine. We'd pray for their safe return. The Germans were still creating havoc with their V-2's. These were rockets which were launched from moving platforms which were difficult to zero in on. They were aimed at the big cities like London, which were obviously civilian targets. The damage from them was devastating. The rockets were generally launched at night. The roar of the propulsion system was enervating. The V2's were not used against the troops. 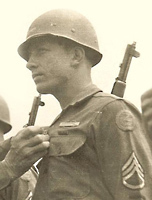 The above story, "My War Story", by Salvatore J. Conigliaro, Jr., Co.G, 406th Regiment, was originally published in the 102d Division "Ozark Notes", Vol. 51, No. 2, Jan/Mar 1999, pp. 9-13.